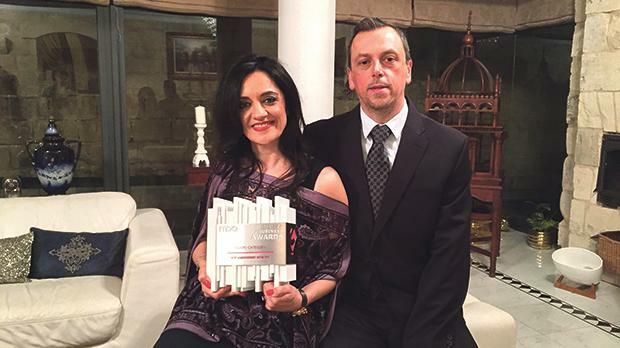 Carmen Sammut, together with her husband Mark, holding the trophy for the eGovernment Initiative award. The sole shareholder of an IT company providing services at Mater Dei Hospital has joined Health Minister Chris Fearne’s private secretariat, the Times of Malta has learnt. Carmen Sammut’s recruitment raised eyebrows among government quarters, particularly because of possible conflict of interest in the provision of current and future IT services to the ministry or entities falling under its umbrella. Government sources said her husband’s close connections to former Nationalist Cabinet minister John Dalli did not go unnoticed either. It could not be established how much is Ms Sammut’s company being paid for the provision of IT services to the country’s main hospital. However, the sources pointed out it must amount to tens of thousands of euros a year. According to the Registry of Companies, Ms Sammut served as director of the IT services company Mall Systems Limited until last September when she re-signed. Still, she remained the company’s sole shareholder but was replaced as a director by Mark Bruno Olivier. Ms Sammut’s IT company is registered at the same address of Cursor Limited, another IT company, whose director is her husband, Mark, a former director and chief officer at Transport Malta. A few weeks ago, Mr Sammut resigned from his post at the transport watchdog. Cursor Limited won a number of government contracts in recent years, including for the development of an electronic messaging system for Mater Dei, which last March was awarded the Best eGovernment Initiative award by the Communications Authority. The company owned by Dr Sammut provided services to the transport regulator at the same time he served as a Transport Malta director. Transport Malta had shrugged off complaints of conflict of interest saying Dr Sammut was not a director of the IT company and that his interests had been transferred to his wife. At the time, the MFSA’s companies’ registry, had Dr Sammut listed as the legal representative of Mall System Limited and as the owner and sole shareholder of Cursor Ltd.
Dr Sammut, who served as consultant to Mr Dalli when he was finance minister and also during his short stint as European commissioner, had assisted Mr Dalli in the drawing up of a report on Mater Dei Hospital in 2014 when the latter was appointed by Prime Minster Joseph Muscat as adviser on the health system. Contacted about the recent appointment and asked whether the ministry believed the move to be tantamount to a conflict of interest, a Health Ministry spokeswoman said Ms Sammut had resigned from her post as director of Mall Systems Limited “prior to her engagement with the office of the Deputy Prime Minister”. The spokeswoman noted that Ms Sammut held “no post with the company” but did not comment on the fact that she was still the sole shareholder. Attempts to contact Ms Sammut for a comment proved futile.